I’ve built an Iris keyboard last week. It uses two Pro Micro controllers for communication between the pair of keyboards and the computer. This article mainly applies to revisions 2 to 2.5 of the Iris keyboard. I’m researching whether I can do modifications to the board, such as adding an OLED screen or using a rotary encoder. In order to do that, I’ll need some free pins on the microcontroller. I found the above diagram in the documentation from Keeb.io. Most pins have a label, but two of them don’t. I set out to see whether all those pins see use, so I can use some of the pins for my own modifications. The pins D0 and D1 are used for I2C communication and serial. They’re wired to the TRRS jack and connect to the Pro Micro on the other side of the Iris. The C6 pin is used for audio when AUDIO_ENABLE is set in the rules.mk file. You might be able to reuse this pin, but only if you don’t use audio or put audio on another pin. The F4 pin is unused in the rev2 version of the Iris. It is used in rev1_led and rev3, however, as a column pin. The F5 pin is unused in the rev2 version of the Iris. It is used as a column pin in rev3. The B0 and D5 pins are used for the LEDs on the Pro Micro. They are not broken out on the PCB of the Pro Micro, and thus are also not broken out on the Iris itself. Theoretically, you might desolder the LEDs and reassign the pins in order to gain more space. The use of these pins is defined somewhere. The Iris makes use of the QMK software project as its firmware. Every keyboard is able to define configuration, mapping pins of the microcontroller to various functions of the keyboard. 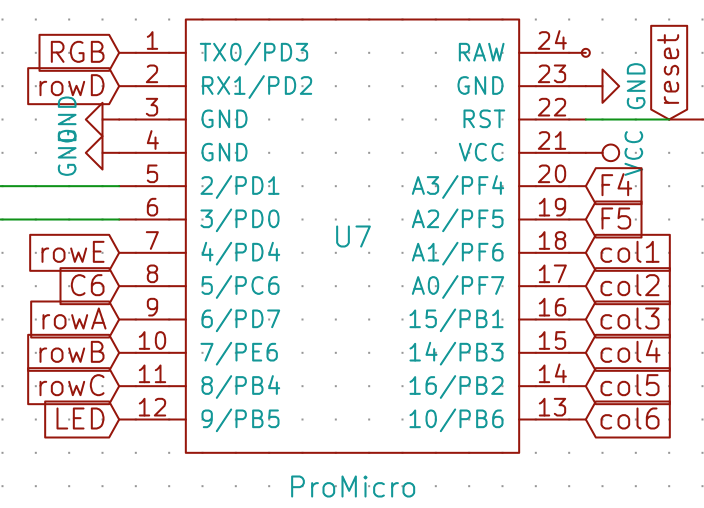 I wanted to know exactly what pins get used for what, so I made a table with all broken out pins on the Pro Micro and their purpose for rev2 of the Iris, ordered by location on the PCB. Note: other revisions for the Iris do use other pins for some functionality, but you’ll be able to look at the source files to see those configurations. The files for the Iris are located in the QMK firmware repository, under keyboards/iris. Not all pins are defined there: some are assigned by convention. D1 SDA Used for serial/I2C. D0 SCL Used for serial/I2C. C6 C6 audio.c, used when C6_AUDIO is defined when the firmware is built. F5 F5 Not used in revision 2. F4 F4 Not used in revision 2. I haven’t yet found direct references to the D0 and D1 pins that are used for serial or I2C communication. They’re not defined in Iris-specific code, at any rate. In drivers/avr/pro_micro.h, the ports are defined in digital_pin_to_port_PGM. In the same folder, there is the file i2c_master.h, which looks interesting. It includes avr/io.h, which in turn includes iom32u4.h, an IO file specific to the microcontroller used in the Pro Micro, the ATmega32U4. It assigns various ports to defines. I’m sure those defines get used in other core code related to serial and I2C communication, but that was a bit outside of the scope of this article. B0 and D5 if you’re willing to desolder the LEDs on the Pro Micro, soldering wire to those connection points and remapping the pins in the firmware. It might be possible to hook up a SPI or I2C port expander on the D0 and D1 pins, making the available ports less of an issue. Interaction with I2C devices may be possible on the D0 and D1 pins, though the Iris uses serial by default. Switching the protocol to I2C should be possible according to the keeb.io FAQ (last question) and the Iris build guide. If you followed the optional step to solder I2C resistors, hardware support should already be there. Software support for I2C doesn’t exist specifically for the Iris. There are split boards that do use I2C, such as the Corne keyboard (also known as the Helidox). With the use cases I have, adding an OLED display and a rotary encoder, I also looked up related documentation and cases. There exists support for SSD1306 based OLED displays in QMK, based on I2C communication. This requires changed to the protocol listed above. 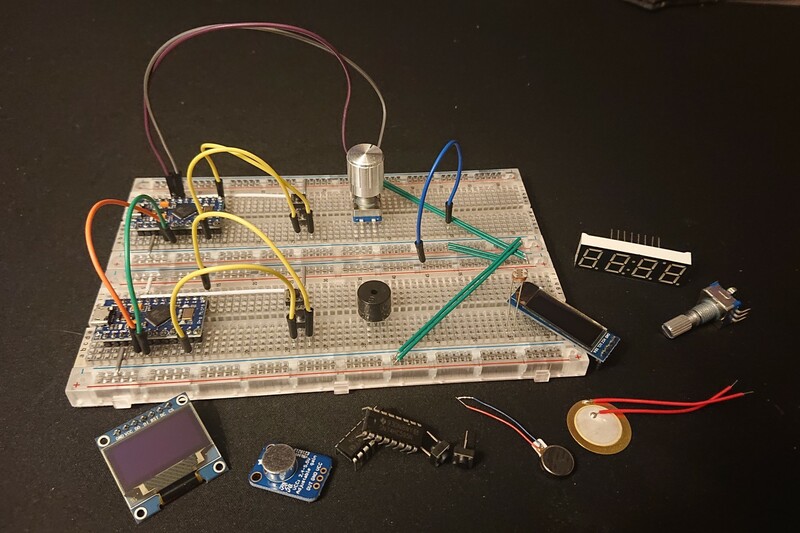 Reddit user /u/LurkerMcNoPost has made a post of his Iris that succesfully uses a rotary encoder, with links to code he wrote to make it work. Official QMK support for encoders also exists, and doesn’t seem to need a specific protocol or ports. For this, the F4 and F5 ports could be used. QMK is a keyboard firmware based on the tmk_keyboard firmware with some useful features for Atmel AVR and ARM controllers. I use this firmware for all of my mechanical keyboards that support it and I love the customizability of it.